Please note though that the Hauck Duett does fold flatter, but it feels like you are forcing the frame, and we only discovered it would fold flatter after some weeks of use. Here is the photo of the flatter fold. 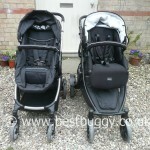 The Hauck Duett and Britax B-Dual look very similar at first glance. 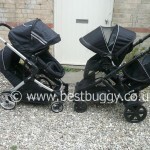 But there is a definite difference in the quality of these two pushchairs and this is reflected in the price, and this should be borne in mind when considering the two pushchairs side by side, because it is not something that is easy to show in photos. 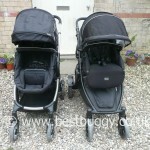 The second difference, that is really quite key, is that the newborn seat for the Hauck Duett is the upper seat (the seat converts easily into a carrycot and the mattress and apron are included in the price), whereas the best newborn space on the B-Dual is the lower seat (although you can put a newborn in both of the B-Dual seats which makes the B-Dual a great twin option). The reason this is key is because it is very easy to therefore put a toddler in the upper seat of the B-Dual, with the option to recline them, or even parent face, whilst your baby is laid flat comfortably underneath. With the Hauck Duett the newborn has to go on top, which makes it almost impossible to find a way in which you can carry a toddler upright in the lower seat, whilst a new baby is carried in the upper seat/carrycot, or even in a car seat. The space for the toddler is compromised and ideally the toddler needs to be reclined to have a baby in the upper seat. 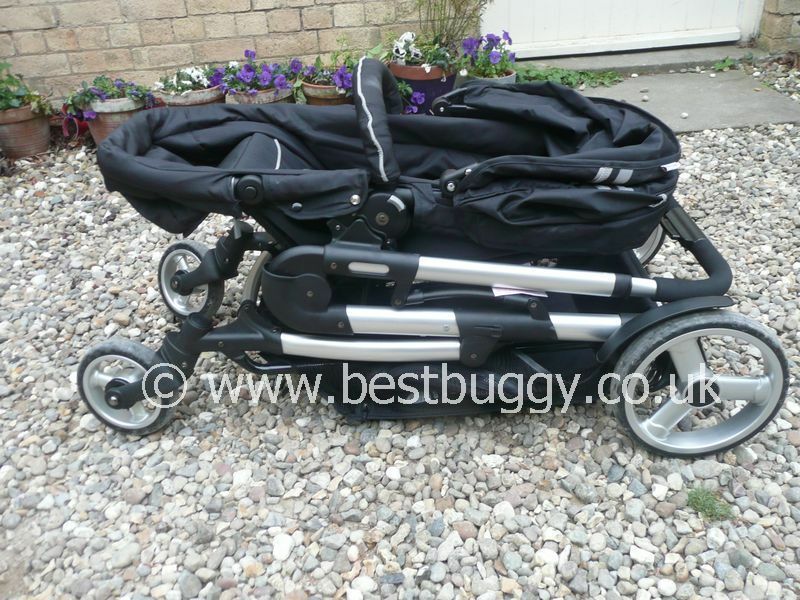 Here on Best Buggy we have considered ways to carry a newborn and a toddler in the Duett and these are discussed under the Hauck Duett reviews, but there are compromises for both toddler and newborn which you need to be aware of. Once you get past six months and your baby wants to be sat up and seeing the world, I personally feel the baby is better off in the Hauck Duett upper seat until they are really above 12 months old. This is because there is not much side support in the lower seat and my baby whilst he can sleep in the seat, doesn’t really have the support I would like. However this could easily be resolved by using a head hugger in the lower seat. The lower seat, unlike the B-Dual, doesn’t lie completely flat, whereas the upper seat does. The B-Dual, as discussed has two lie flat seats - the upper seat, and the lower seat. Both seats lie completely flat but the lower seat has a carrycot type feel with three sides rasied up to protect the baby. You can add a soft cot to easily remove a sleeping baby, or another baby nest or cocoon, or simply use blankets to line the bottom seat. You can add a hard bodied carrycot in the upper seat position, or another soft cot in the seat unit. This would be great for twins, but it does compromise a toddler situated underneath, who would have to be reclined. The upper seat can parent face, but again this would compromise a toddler as you have to remove the adaptors that push the upper seat forwards. What does work well is having the car seat in the upper position. The baby is nice and close to the parent and the toddler can still sit upright. My toddler looks very comfy in both the Hauck Duett main seat and the lower seat. At first I thought her space would be limited in the Duett because of a bar running across the centre, but I quickly realised this wasn’t so (and it is a great place to hang toys for a baby,) and she has plenty of room to stretch her legs out. Meanwhile my toddler doesn’t sit quite as well in the B-Dual seats. I have measured the seat and can’t see why this would be, but she seems to ‘hang’ from the seat unless I raise the footrest horizontal for her. She likes the lower seat, but it has a deck chair feeling with her feet outstretched and my toddler prefers to be reclined a bit. So from a toddler perspective I think the Hauck Duett probably has the better seating positions in both seat units. There is no issue with seat width or head height in either pushchair for her. The wheels on the Hauck Duett are smaller and give a harder ride which is quite noticeable. 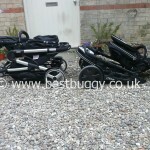 But both pushchairs push brilliantly with two older children on board. I have walked miles with both and enjoyed the push. The Britax B-Dual has larger wheels, but also a much wider wheelbase, and large wheel guards. I have caught these several times going in through shop doors. The Britax B-Dual has a rotating handlebar which gives a good range of height settings from low to high. The Hauck Duett has an extending handlebar but this goes up quite high. I have struggle to fold the Hauck Duett, whereas the B-Dual is relatively easy. 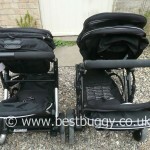 Both have a couple of steps to the fold, but both pushchairs will fold with both seats on. As I have said at the start, there is a flatter fold to the Duett than in these photos, but it feels like you are forcing the frame shut. I am not sure whether the frame should fold that small! 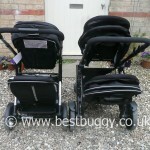 The B-Dual folds so that you can pull it along on its back wheels when folded which is a huge help as both these pushchairs are heavy. I find removing the lower seat on the Duett is hard, but it is easy and intuitive on the B-Dual. 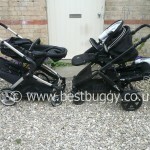 Both pushchairs are sturdy and stable, and handle well off road over grass and bumpy unmade tracks. The B-Dual has been one of the best pushchairs I have tried across sand. Both have excellent baskets, although I like the mesh preventing shopping from falling out of the front of the B-Dual which means you can pack it to the top, but equally I like the gap at the back of the Duett to put drinks and my handbag! I like both of these pushchairs a lot. They work really well with a toddler and older baby on board. I think the B-Dual certainly is the most suitable from birth with several newborn baby options. However I really like the Hauck Duett but I would recommend it for babies above six months old who don’t need to lie flat any more. 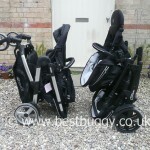 I would recommend anyone looking at a Phil&Teds to consider these two pushchairs as an option as they are similar in style, but are shorter in length, and seem to work better in every day life. 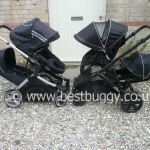 I think these two pushchairs offer a lot to a family and are two of the most practical tandems on the market and I would recommend both.